Our new Co-Working Series is here to tell you everything you wanted to know about Co-Working Hubs! A workplace that drives community, collaboration and innovation. Co-working hubs came to stay and they are taking over the world. In only 3 years, we estimate growth of 90% in co-working spaces which means over 35,900 hubs! This data means that not only freelancers and SMEs will be using those spaces. Large corporations are becoming aware of the benefits and will be jumping in. In 2017 IBM partnered with the recent coworking Galvanize in New York. Later, IBM announced a new learning program called IBM Cognitive Course focused on AI cognitive skills and data science for scientist and developers. One month later, IBM opened a new space to employ 600 people. Barclays bank launched a fin-tech space called Rise. They partnered TechStars, which gave Barclays a coworking space with three floors, auditorium and meeting rooms. Microsoft announced their desire to jump into a new and more flexible work culture. They gave 30% of their employees the access to the coworking spaces WeWork. If you’re worried about costs, you should reconsider. A good co-working space will save you time and money. Everything you’ll need in an office is provided and the maintenance is also included. You won’t have to worry about rent, bills, equipment, coffee, snacks. You pay a monthly fee and all is taken care of. Co-working spaces make it easier to Smart Work! Most corporations partners with coworking hubs offer some flexibility. It also eases the commute as many employees can choose which location is more convenient. Could be location or hours, as long as you work more productively, that’s Smart Working! Co-working and Smart Working connect to productivity. Employees tend to be more productive surrounding innovation and new ideas and also networking with other workers. Plus, co-working allows autonomy and flexibility, so you can enjoy work-life balance and motivation. 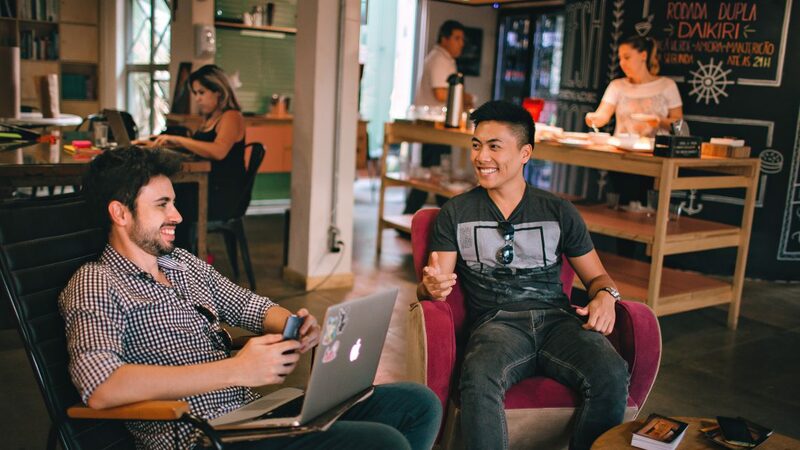 When you work in a coworking space, you’re constantly connecting with people from diverse backgrounds, fields, expertise and experiences. That makes coworking hubs the perfect place to network and to find top talent! The social and collaborative environment of coworking makes the atmosphere and the interactions more relaxed. It gives companies access to innovators, disruptive ideas and new talent in a community environment. That makes it way easier to find your perfect match! The shared environment of coworking hubs stimulates the sense of community. Diversity & Inclusion is a must-have in any companies culture nowadays. Coworking makes it easier. The atmosphere is filled with diverse people who believe in flexibility, exchange of ideas and innovation. Coworking spaces have everything to provide companies with a diverse and helpful community that can even result in excellent business prospects. What happened when Google asked 5,600 employees about how they work?